CoMo Booster - Launch your Raspberry Pi Compute Module! Make the Raspberry Pi Compute Module work for everyone, better than ever! 'CoMo' stands for the Raspberry Pi Compute Module. CoMo Booster is an enhanced motherboard for the Raspberry Pi Compute Module. It's essentially a same kind product as the Compute Module IO Board. Why we made CoMo Booster? 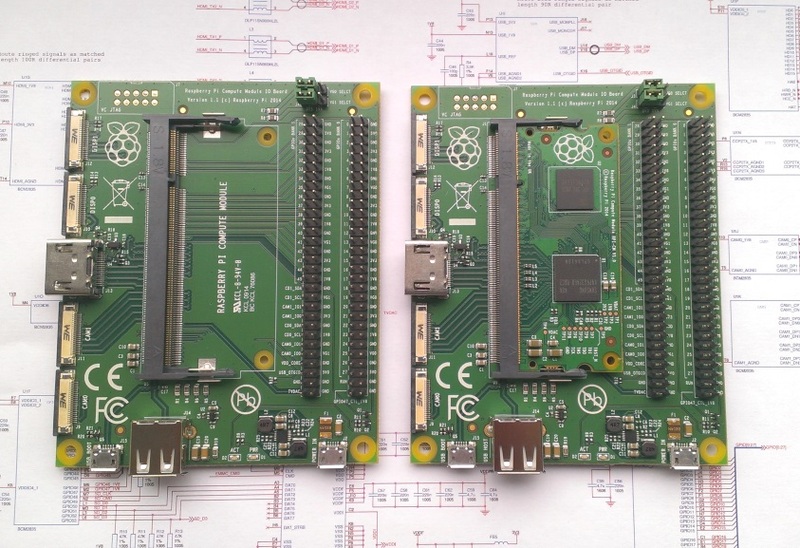 We think the Raspberry Pi Compute Module is cool. It's small but flexible, and it's brilliant to embed it into systems and products. But as the Raspberry Pi blog said, The Compute Module is primarily designed for those who are going to create their own PCB. So that means this is not an "everyone's" Raspberry Pi. What about the Raspberry Pi Compute Module Dev Kit? This kit includes a Compute Module IO Board. The thing is, this IO Board is just a simple breakout board, it only provides basic and necessary functionalities. Again, it helps designers get started, not suitable for a normal Raspberry Pi fan. Furthermore, the Compute Module Dev Kit is not cheap. So we decided to make a powerful but cheap motherboard for the Compute Module so that everyone can enjoy it. So what? You could ask, why? Why do I need this CoMo Booster plus Compute Module? Why not just a normal Raspberry Pi? Because the Raspberry Pi Compute Module is a new product, because it looks cool and worthwhile to give it a go! Just like that, we guess geeks and Raspberry Pi fans should be satisfied.Actually we can also answer this question in a more sensible way: features comparison. Can use 3.7V lithium battery as backup power supply. The system automatically switches to the battery power when external power outage happens. It also automatically charges the battery when the external power source is connected. OLED screen(128 x 32), can display any information you want. CoMo Booster is a very complicated product. It uses a double-sided four-layer PCB, and more than 240 various components. It took Herman and Wei nearly an entire week to finish the soldering for the first two prototypes. Trust me, it was a horrible job. And then a really big trouble came out. We contacted more than 10 PCB factories in China but no one would like to manufacture CoMo Booster. The reason is simple: the product is too complicated and the quantity we want is not large. So either we simplify the CoMo Booster or we order a large quantity of them. We cannot simplify the CoMo Booster obviously. And the so-called Large Quantity is 600 units! We can't afford it. So we come here, again, to ask for help. Now (8 July, 2014): We are still testing the CoMo Booster prototype without the Raspberry Pi Compute Module plugged in. Next week (After 14 July, 2014): We should be able to receive the Raspberry Pi Compute Module, start testing the prototype with it. 1 August, 2014 - 15 August, 2014: Get CoMo Booster v0.1 ready. 1 October, 2014 - 7 October, 2014: China National Day long holiday. The whole China will stop and go to sleep. Nothing can be done during this time. 8 October, 2014 - 15 November, 2014: Manufacturing should be in progress. After 16 November, 2014: Start posting out CoMo Booster boards. So yes, hopefully we can start posting before December. Karl Wang - I'm a software programmer live in Adelaide hills, South Australia. I have two sons and a German shepherd-corgi-crossed dog named Ajax. They are all very energetic and dynamic and keep me busy. Fortunately my wife Jacqui helps me a lot so that I have time to work on this project with my friends. Herman Liu - I'm an electronic engineer, a hardware nerd. I work for a large communication equipment company that everyone knows (I guess). I hate flying but have to do that from time to time. I love soccer and watched pretty much all the games in this World Cup (so far)! Don't worry, I still have enough energy to make the CoMo Booster better! Wei Zhang - I think I need to say sorry to the employees in my factory. I took most of my time on the CoMo Booster project in the last two months. They could be confused and wondered if I still wanted to keep the factory running or not :D I'll take care of the manufacture process of the CoMo Booster, and make sure they are ready for you as soon as possible. Penny Xie - I put a lot of my money into CoMo Booster project. I was bit worried and hoped my friends really knew what they were doing ;) But when I saw the prototype of the CoMo Booster, it was a big relief. It's pretty cool and you'll love it! My other job in this project is to pack the products and post them to you. I didn't think this was a hard job until the Fairywren project almost killed me. 1. We have just received the Raspberry Pi Compute Module, today (24/7/2014 Please refer to Update #1). That means we just started testing the CoMo Booster with the Compute Module plugged. We'll try to find and fix any potential issues as soon as possible. 2. For the shipping of our Fairywren project, we chose Posten (http://www.posten.se/en/Pages/home.aspx). We thought the more expensive, the more stable. Well... We don't know what to say. The Fairywren boards were all posted out by last November, but we still received some emails months after that and said that the items hadn't arrived. This time, we'll use Hong Kong Post. We'll also offer you a chance to update your shipping method to DHL. We'll definitely try our best to help you find your lost parcel but please be aware that when the parcel has been posted out, it's out of our control. 3. All of our team members work on spare time, weekends and holidays only. We all have 'real' jobs to do, to pay the bills. We'll try our best to answer your questions as soon as possible. But, there could be some delays. Thank you for your understanding! Thank you for your support! You will receive a "Thank You" card and Geekroo stickers from us. You will receive: one CoMo Booster Lite motherboard (that is, a CoMo Booster WITHOUT OLED and WiFi module), one USB-Ethernet adapter(Please see Update #1), a "Thank You" card and Geekroo stickers. You will receive a parcel that includes: one CoMo Booster motherboard, a "Thank You" card and Geekroo stickers. You will receive: one CoMo Booster motherboard includes one Raspberry Pi Compute Module, a "Thank You" card and Geekroo stickers. You will receive: one CoMo Booster Motherboard includes one Raspberry Pi Compute Module, one Acrylic Case for the CoMo Booster, a "Thank You" card and Geekroo stickers.